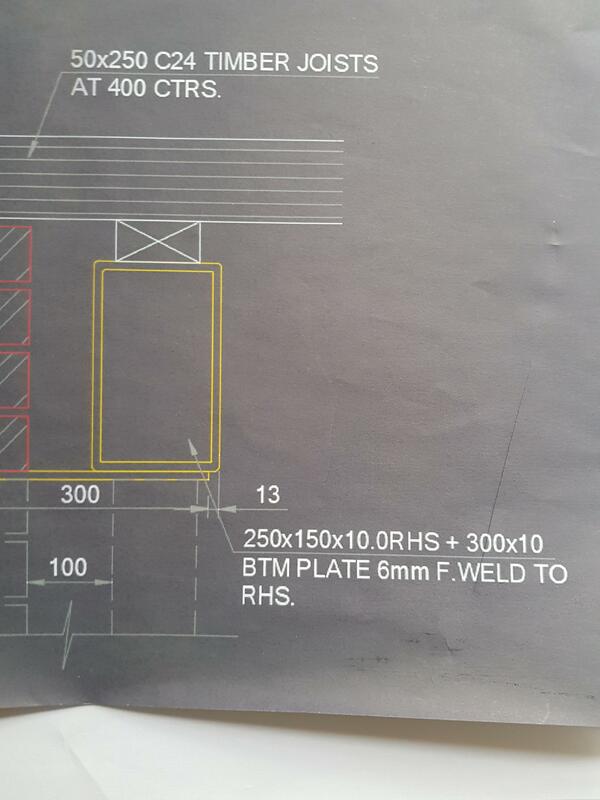 I'm slowly getting concerned about lifting my lintel for my new single storey rear extension. 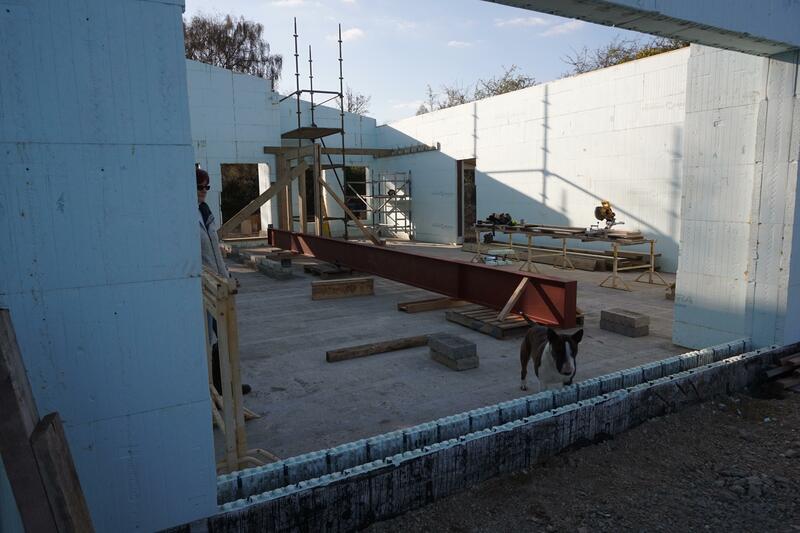 The lintel will be 7m long and weigh around 600 kg . A crane is an option , but at £500 plus vat I'm looking at other alternatives. I have no experience lifting this kind of weight and I'm not really sure if it can be man handled with a bunch of guys. But a pair of genie lifts should do it if you have the space below. I think that would be too heavy to man handle. Our 11 metre Kerto beam was lifted gracefully by the builders 13t digger with a boom extension. do you have anything similar available? 14 people could do it comfortably if they were directed and did as they were told when they were told immediately and without debate. Hands on... lift...lift up, said the old soldier. it is possible but I’m not really being serious, that’s a lot of weight! we intend sliding it on rollers made of scaffolding tube through the door, pushing it with the digger, we will then use two of the gennie lifts to lift it up, we will build a steel scaffolding tower under the beam as we lift it, installing a new lift every 600mm we lift it up, just in case of any mishaps. if you have limited experience with this I would find somebody to help you with the relevant experience who has half a dozen mates to help. Here is one of our 3 x Kerto (much shorter than 11 meters 😁) being lifted into place. How does the cost compare to hiring a telehandler with jib to hiring two genie lifts? Your looking at approx 420kg for the box section. What height do you need to lift it to? A genie lift approx £90 a week each, We also hired a telenhandler for a week for £200 plus vat when installing the windows. Travis perkins also hire genie lifts. 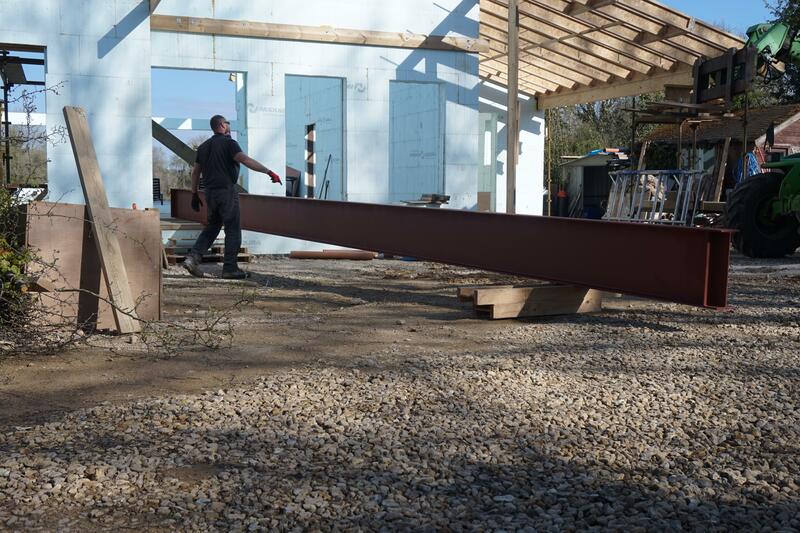 10.5 metre steel, my Dad and I hired a couple of Genies, very near the 4.8m height limit. A little sketchy but get organised, go slow and its done. Telehandler just hasn’t got the reach. How is the steel being delivered? If del lorry has haib could they lift into place? Genie lifts are excellent bits of kit but need a flat smooth surface to work on. Think approx 19m I beam @ 7m height with 3x genie lifts. Word of warning though. Genie lifts do wobble a bit when they are high. I think weight was about 390kg. 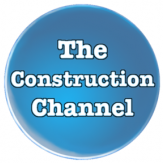 As @Construction Channel said they do wobble. We hired 2 x SL18. Max load 295kg each and height 5.6m. Think I'd bottle it at this. Way to top heavy for my liking! Do you (or a local friend) need anything else doing with a crane at the same time? Could you hire a 1t spider crane? How did you do that with a genie lift? 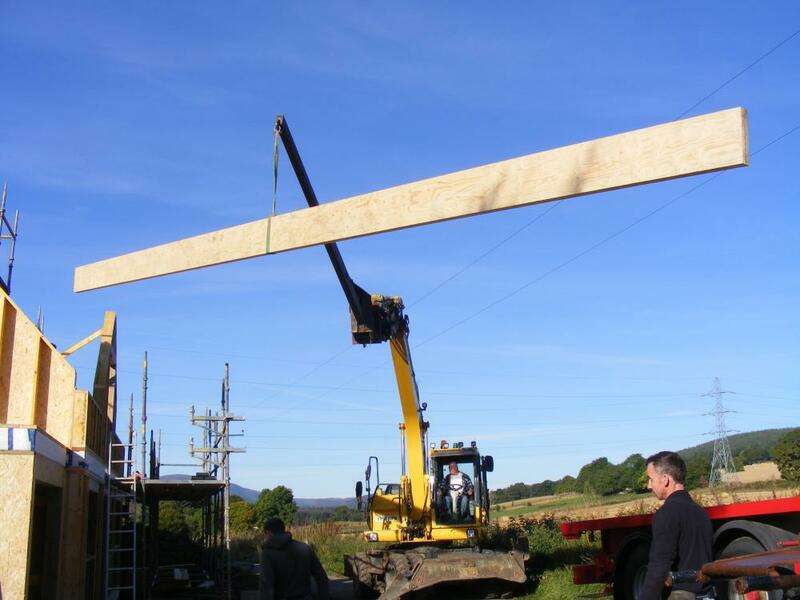 The ridge beam must be longer than the gap between the gable ends so won't fit inside the gable ends to be hoisted up. Unless you hoisted it diagonal and them moved the genie lifts with it up there? That sounds a bit dodgy? Tbh it was pretty straight forward. Two lifts where enough weight wise so the third was used for manoeuvring. Manoevring the lifts on the polished slab was very easy. The the middle lift turned the opposite way, this firmed up for wobbling. We lifted and moved the beam up the 45' gable. When the steel was in place plus 3x genie lifts supporting we lifted the support box section into place with chain blocks. Doing it this way gave us time to cut and prep supporting steel etc ourselves. There was no access for a telehandler and to be honest I don't know if there room for a crane. Although looks dodgy in pictures it was a pretty smooth operation. My biggest problem is access. The rsj needs to be moved down the side of my house (6ft gap) through into the back garden before I even think about lifting it. I first thought around 8 men could manage it, but after reading about people moving similar weights I don't think it's possible. Is this a new build, have you got a pic. there was a post on here (could have been one I started) where someone posted about using trolleys to move RSJ/beams, that may get it into place and then use a genie lift or two?